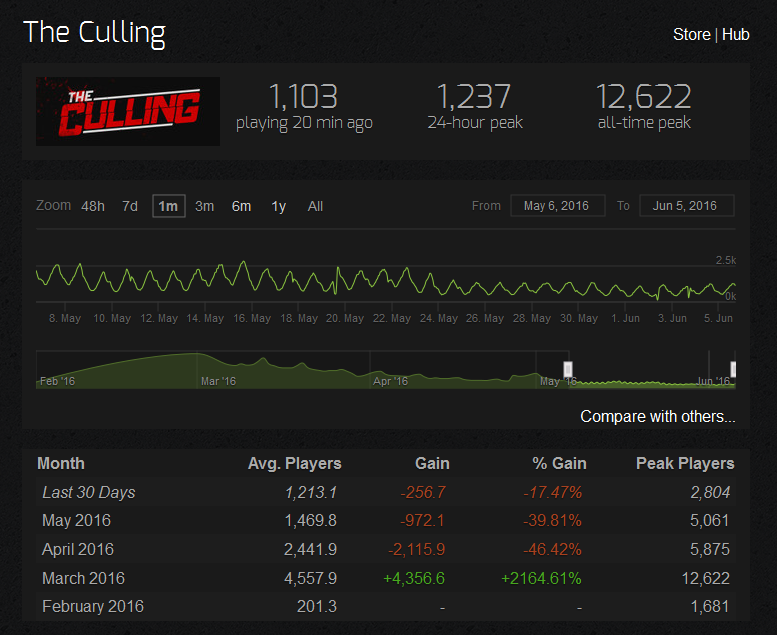 If you’ve been playing the Early Access release of The Culling — a multiplayer-only Battle Royale or Hunger Games inspired survival title from Xaviant Games — then you might have noticed a sharp drop-off in the player base, and a brisk increase in the complaints and disgruntlement from gamers on both the forums and in the user reviews. The team recently patched the game to add a Showdown arena, where players attempting to team up in the 16-player free-for-all mode will have to face off against each other in a designated arena or risk the penalty of death. The free-for-all mode is supposed to be about individual survival, where-as the team mode is supposed to be about tag-teaming with someone to work towards victory. The Showdown mode was completely overshadowed in the patch notes on Steam, where users took the time out to completely assail Xaviant’s decisions with The Culling, especially regarding balancing the combat and the rock-paper-scissors setup that it used to have. Some individuals in the forums have stated that the people complaining about the combat becoming less fun after the balance patches just don’t know how to play. Others have defended the developers, saying that only a small minority of individuals are complaining and that Xaviant is on the right track with The Culling. However, if you look at the recent reviews from those who have purchased the game, they rank up in the thousands. As indicated in the image below. So what happened recently? The balance patches. “Our approach to combat netcode relies heavily on client prediction to allow for the smoothest, most responsive experience possible. When you press a button, your client expects those things to happen when those inputs reach the server, and will start playing animations in anticipation. The patch notes over the past couple of months since the game released in February hasn’t done much to curb the complaints on the Steam forums, as threads regularly pop-up with players citing their reasons for “leaving the game”, while others claim they are “about fed up” with the direction The Culling has taken. Others are simply curious what happened to the game being fun and smooth when it came to the combat. While thousands of negative reviews popping up recently and the forums being filled with complaints could be considered a mere drop in the bucket compared to the overall player base, the reality is that there is a literal drop-off in the player base. In fact, within the last 30 days, the game has lost 73% of its daily active players since going live in February, which is not a good sign for a game that’s supposed to be growing its player base leading up to its release in 2017. You can check out the stats below from SteamCharts.com. Despite having more than 460,000 owners, the Steam Spy stats also seem to back up what the Steam Charts are showing: that the player drop-off rate is accelerating. 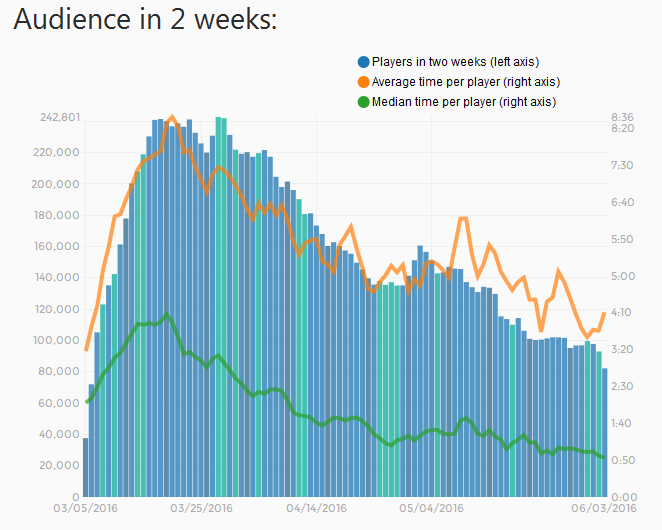 Within the last couple of months – after peaking at 242,000 players at the end of March – the Steam Spy stats show that the drop-off has been significant, with the active player count diving down to 82,000 as of June 3rd, 2016. The drop-off rate seems to be consistent with the release of patches where the community felt it made the game worse. While overall ownership is increasing, the active player base appears to be decreasing, which is a death knell for a multiplayer online game. It’s easy to dismiss claims about developers not listening to their community or a fringe few being a loud vocal minority, but they’ve essentially seen their total active player count drop by 34% between March 28th and June 3rd. Combined with lower daily active users and the dissent being made consistent and apparent on the forums, along with the growing collection of negative user reviews, hopefully Xaviant Games is taking note. 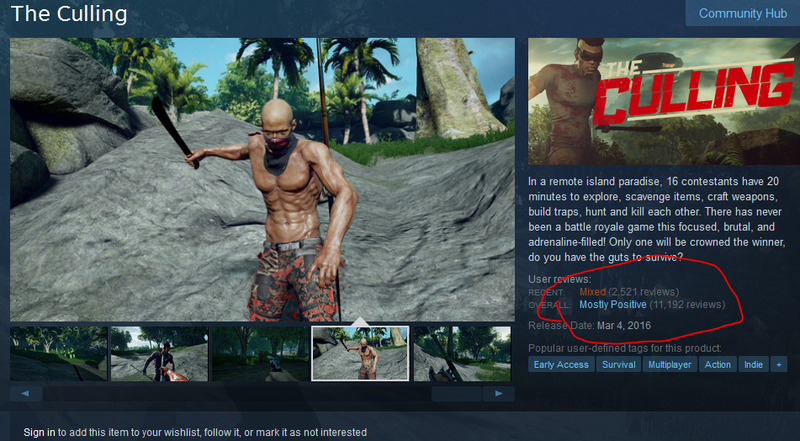 The developers really should be looking into not only growing the game for its big release in 2017, but also considering what made The Culling’s so popular when it released onto Early Access back in February. Seeing double digit drop-offs each month is not going to help with the long-term sales of the game, nor will it help grow the community, especially when a game like The Culling is so dependent on maintaining a strong multiplayer community in order to function. You can learn more about the multiplayer survival by visiting the Steam store page or by visiting the official website.